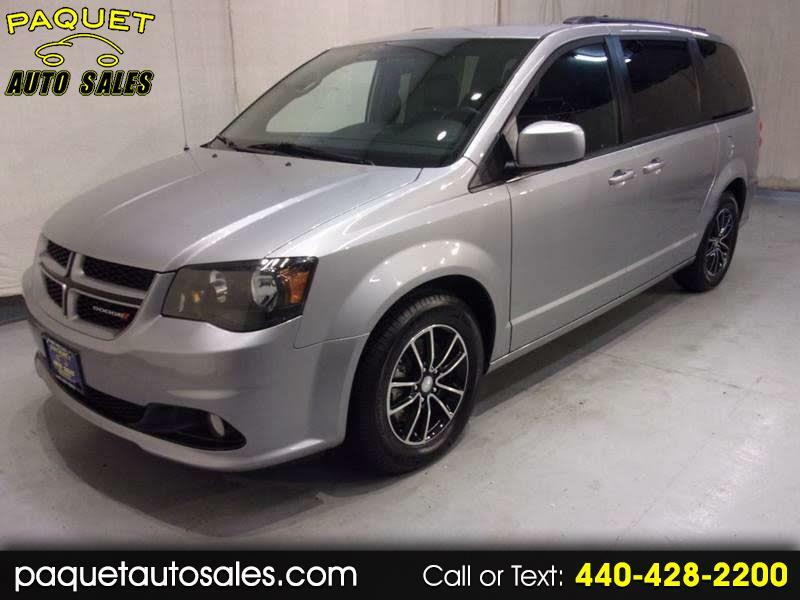 VOICE ACTIVATED NAVIGATION---ONE OWNER---3RD ROW STOW-N-GO SEATING---CLEAN CARFAX REPORT---WELL MAINTAINED---REMOTE START---LEATHER---REAR CAMERA---REMAINING FACTORY WARRANTY---ONLY 17,000 MILES---BLUETOOTH AND HANDSFREE PHONE CAPABLE---GT WITH FLEX-FUEL 3.6 LITER V6--- 2018 DODGE GRAND CARAVAN GT in a gray exterior finish with remote operated power sliding side doors, fog lamps, black luggage rails, rear roofline body color spoiler with 3rd brake light, black grill inserts, power rear hatch with remote operation, rear wiper, power side vent windows, tinted rear windows, ECON mode, traction control, automatic headlights, 17" black and silver alloy wheels, Michelin tires, garage door remote, body color folding heated exterior mirrors and door handles, keyless entry with multi-function remote. Inside you will find a loaded black with red stitching leather interior featuring powered and heated front bucket seats with headrests and armrests, center console with illuminated cupholders, front and rear overhead consoles with reading lights, tachometer, power windows, door locks and exterior mirrors, digital clock, compass, external temperature, vehicle information display, heated tilt and telescopic steering wheel with mounted stereo, cruise, voice, information and phone controls, air conditioning with dual climate, rear air with controls, touchscreen CD/Satellite ready media player with Bluetooth, Navigation, voice controls, Hard Drive memory, Phone and aux. inputs, Stow-N-Go 2nd row bucket seats with armrests and headrests, split folding 3rd row Stow-N-Go seats, rear defroster. Fully inspected by our service technician and carrying the balance of the factory warranty. Detailed inside and out and ready for delivery. Stop in or call today and speak with one of our friendly sales staff with any questions that you may have.